Last month I introduced you to LoveLula beauty box and in case you missed it, just take a look at this post here. LoveLula beauty box is great for green beauty fans and those who like to try out different natural beauty brands in a cost-effective manner. The box costs only £12.50 a month with a value of products exceeding £30 – normally you will get between £35 and £40 worth of products which makes it amazing value for money. This cruelty-free and vegan lip balm smells amazing! Its tropical scent with papaya and pineapple makes me salivate – it smells so delicious, better than any fruit yogurt. It’s made of cold-pressed papaya seed oil with an added natural flavour of pineapple – the two ingredients responsible for that delicious scent. As soon as the balm touches the lips it just melts, leaving a sheer protective layer on the lips. The balm also contains moisturising coconut oil and cocoa seed butter. It’s so natural that also if you swallow some by accident it won’t do any harm. I love it, although it won’t stay on lips for long and you have to re-apply often. Check it out on LoveLula website. I haven’t tried any products from PHB (Pure. Handmade. British.) before so I was really happy to discover this brightening hand cream. This hand cream is certified vegan, cruelty free and halal. It’s made with natural and organic ingredients with an addition of essential oils of Neroli and Ylang Ylang to create an uplifting and sensual scent. The scent is quite powerful and I know not everybody will be a fan of it but I don’t mind it. The PHB hand cream is pretty nourishing but I wouldn’t say it absorbs instantly which is claimed on its packaging. You only need a small amount and if you put too much on your hands it will need more time to absorb. I was so happy to receive this mask as it’s perfect for my combination skin prone to breakouts. Recently, my skin has been breaking out more often than I would want to (stress!?) so as soon as I received this mask I put it to the test. It’s a really interesting mask actually – when you are applying it and when you are washing it off, it exfoliates your skin as it contains natural exfoliating particles (I think it’s sugar, looking at the ingredients’ list). Kaolin Clay draws out impurities and toxins while Japanese Seaweed Extract detoxifies and smoothes the skin. Liquorice helps minimise inflammation and Rose Water soothes irritation. I really love this mask, my skin felt baby soft after using it and my breakouts felt reduced in size. The mask contains hydrating shea butter so your skin doesn’t feel tight at the end. However, you still need to finish with a toner and moisturiser/facial oil as your skin will feel thirsty for moisture once the mask has been removed, at least mine did. I tried a couple of samples of this moisturiser previously and based on my previous experience I wouldn’t recommend this SPF day cream. While I love it how light it is and so good for combination skin, it doesn’t offer a good sun protection. I tried it in Spain in May and my face went slightly red after using it. It’s a shame because it’s a lovely cream but not great for people who are highly sensitive to the sun. I think it may work in the UK as the sun it’s not that strong here but I would still not recommend it to people with a pale complexion. I left my least favourite product for the end. It’s the biggest product from the box and it’s worth £16.00. It contains 100% natural essential oils of Jersey Lavender to soothe and relax and Ylang Ylang to balance the mind and ease tension. Lavender definitely overpowers any other scents in this body wash. While it doesn’t contain SLS, mineral oils or parabens, it contains some other ingredients which are not exactly natural and may cause irritation. Methylisothiazolinone, for example. This synthetic preservative is widely used in cosmetic products and can cause allergic reactions and dermatitis. Another ingredient which I am not happy to see is propylene glycol – this is a synthetic compound which you can actually find in anti-freeze. It can also irritate skin and it’s probably not safe for infants or pregnant women. So no, I won’t be recommending this product. If you are a green beauty fan and want to subscribe to LoveLula beauty box click here. It’s only £12.50 a month, including the postage. You can cancel your subscription anytime. And remember, every month you will get 20% off on all the brands found in the box. Are you subscribed to LoveLula beauty box? 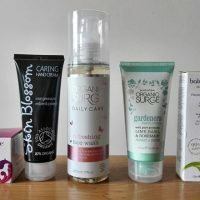 What did you think of this month’s products? I want to buy everything on LoveLula! Their products are amazing! Didn’t realise they have a subscription box now. Need to look into that. LoveLula beauty box is such a good value for money, well worth subscribing. Just to mention that the price will go up in June to £13.95 (when you subscribe in May) but at the same time the value of the products in the box will increase so there is nothing to lose really. The lip balm is amazing, I love the scent so much! This beauty box is really a good value for money but just to mention the price will go up in June to £13.95 (when you subscribe in May) but at the same time the value of the products in the box will also increase so you don’t lose anything really..